Joyce Carol Oates in 2014, nearly 70 years after her magical first visit to the Lockport Public Library. In all of world literature, few authors are as highly esteemed and abundantly prolific as Joyce Carol Oates. Several of her more than 40 novels and numerous short stories, essays, and poetry collections have won honors including the National Book Award, the O. Henry Award and the Pushcart Prize, and she herself was awarded the National Humanities Medal. From the early ’60s to today, her works have often been dark, brooding, even Gothic – but always revelatory and ineffably beautiful. Oates grew up on a small farm on Transit Road in Millersport. Her parents barely scraped together a living. She attended a one-room schoolhouse on Tonawanda Creek and, later, commuted via Greyhound bus to schools in Lockport and Williamsville; went to church in Pendleton; accompanied her father, a tool and die man at Harrison Radiator, on long, meandering drives through Niagara County and on excursions to Buffalo to watch Golden Gloves boxing. As a schoolgirl she spent her off hours wandering, alone, through the streets of Lockport. Much of her writing is suffused with scenes and characters from Lockport, Niagara Falls, Buffalo and Toronto, sometimes named explicitly, but more often present only implicitly in mood, circumstance and landscape. Though Oates moved away decades ago, her dark imagination bears the unmistakable imprint of the Niagara Frontier. Yet only recently has she discussed in detail her childhood here, as if she needed the time to fully understand how this strange, stormy region molded her mind and soul – and how it made her a writer. … bookcases lining the walls — books with brightly colored spines — astonishing to a little girl whose family lives in a farmhouse in the country where books are almost wholly unknown. That these books are available for children — for a child like me — all these books! — leaves me dazed, dazzled. Thus began Oates’s lifelong love affair with the written word. 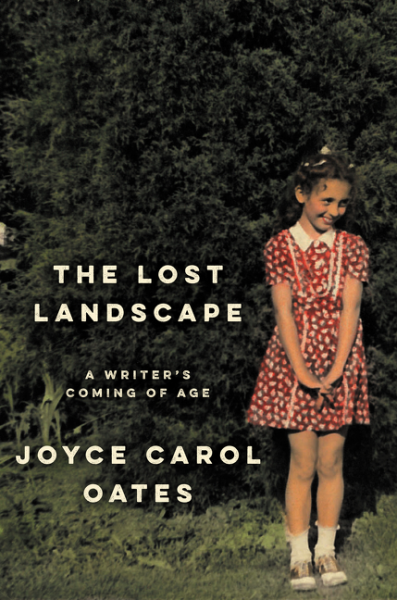 But what she described in that article turned out to be just a foretaste of the fully realized work would come five years later: Oates’s haunting memoir of her childhood, The Lost Landscape: A Writer’s Coming of Age. Oates, the young farm girl, on the cover of her 2015 memoir of childhood along Tonawanda Creek. Its focus is upon the ‘landscape’ of our earliest, and most essential lives, but it is also upon an actual rural landscape, in Western New York State north of Buffalo, out of which not only much of the materials of my writing life have sprung but also the very wish to write. That wish to write has turned out to be a gift to the world. Wild Bill Donovan he was called, the most famous son of Buffalo’s Old First Ward. He was the man who basically invented America’s intelligence apparatus, having founded and directed the Office of Strategic Services during World War II, the spy agency that eventually became the CIA. Lithograph c. 1850 by Francis D’Avignon, after a daguerreotype by Matthew Brady. Library of Congress Prints and Photographs Division. It seems hard to believe now, but Millard Fillmore, 13th president of the United States, was one of the most respected statesmen of his time, widely celebrated for his ability to find compromise. Yet that very quality would ultimately ruin his reputation -- both in the eyes of history and, long before that, in the eyes of his fellow Buffalonians. Portrait by Carl Van Vechten. Library of Congress, Prints and Photographs Division, Carl Van Vechten Collection. For one brief era, Buffalo, or at least one part of it, was an integrated place where people of different races and ethnicities mixed freely and comfortably. The time was the turn of the 20th century, the place was the Near East Side, and the environment that flourished there produced some of the greatest music America has ever heard.